Prep a sheet pan with nonstick cooking spray or line with a silicone baking mat. Combine the dry ingredients in a large mixing bowl. Remove the butter the from freezer and use a box grater to grate the butter into dry mixture. Work the butter into the dry ingredients using a pastry cutter or two dull butter knives. Add the buttermilk and stir just until the mixture is combined. Roll the dough onto a lightly floured cutting board. Gently pat it into a flat 8-inch circle. Using a 2-inch circle cookie cutter, cut the dough into circles and transfer onto a baking pan. Your circles should almost touch to avoid “wasting” dough. Any leftover dough scraps can be re-rolled and cut. Brush the top of each biscuit with milk. Bake 17-18 minutes, until lightly browned on the bottom. Reheat in toaster oven just until warmed. 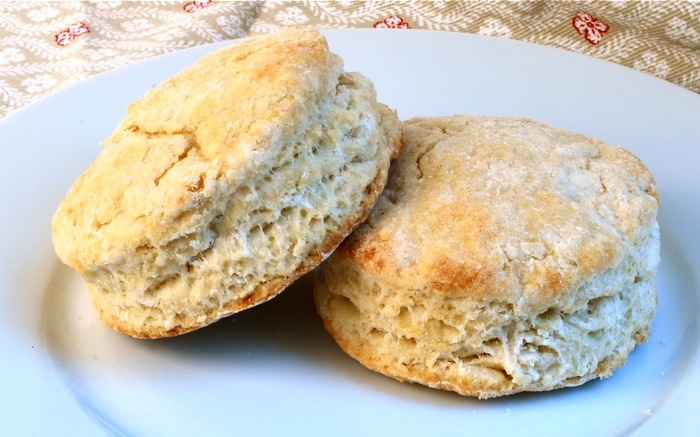 Serving Size: Makes 12 biscuits.